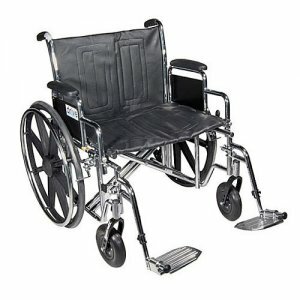 Sentra Heavy-Duty Wheelchair with Detachable Desk Arms and Swing-Away Footrest. Carbon steel frame with TRIPLE coated chrome for an attractive, chip-proof, maintainable finish. Reinforced steel gussets at all weight bearing joints provide additional strength. Durable, heavy gauge, reinforced naugahyde upholstery. Padded armrests provide added patient comfort. Composite Mag-style wheels with chrome handrim are lightweight and maintenance free. Dual position front fork. Dual position front frame. 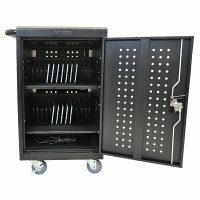 Comes standard with carry pocket on back rest. Precision sealed wheel bearings in front and rear ensure long lasting performance and reliability. Aluminum footplates are attractive, crack-proof and lightweight. Reinforced side frame, caster journals and dual cross bars. Comes with push to lock wheel locks. Width (Open): 29"; Width (Closed): 13"; Height: 36"; Seat To Floor (Height): 17.5"-19.5"; Back (Height): 18"; Seat (Width): 20"; Seat (Depth): 18"; Overall Length w/ Riggins: 42"; Product Weight: 53.7 lbs.